In my view, one of the most impressive and majestic animals is the elephant, in particular the white elephant. Hence, in Thai culture the white elephant is called ‘chang samkhan’ which means ‘auspicious elephant’. Whitness is regarded as an sign of purity in this context. 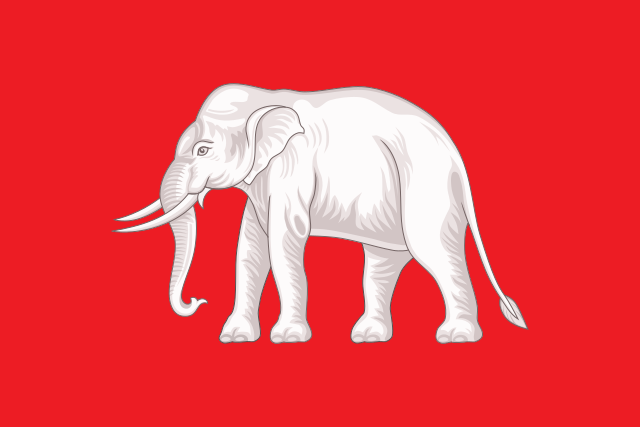 The white elephant has an important meaning in both Hinduism and Buddhism. In Hinduist thought, the white elephant is related to the God Indra who is also a guardian deity in Buddhism. His elephant can also fly and it is called ‘Airavata’. This kind of elephant is thus also related to Buddha’s conception since his mother Maya is said to have been circled by a white elephant three times until it entered her womb through her right side. Thus, in Thailand white elephants (‘chang phueak’) are not only considered to be auspicious but they also belong lawfully to the King. Have you ever seen a white elephant? In fact, ‘chang phueak’ are not necessarily albinos but are much paler than common elephants. Their skin may be light grey, beige or even have a rosy or pinkish hue. Think of the impressive procession of eleven white elephants at the Grand Palace in honor of Thailand’s late King Bhumibol Adulyadej in Bangkok on the 8th November 2016. 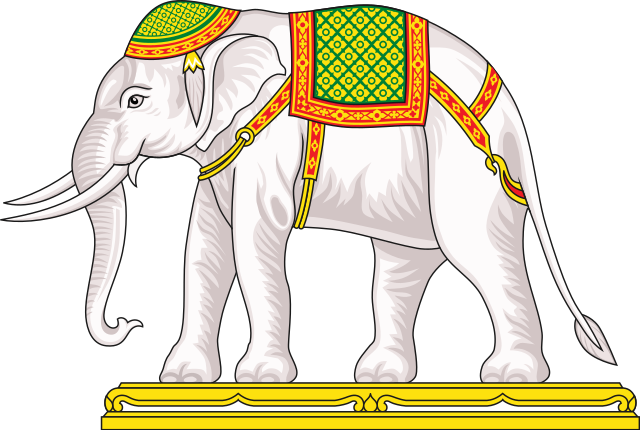 In Thai culture, the status of Kings have been rated by the number of white elephants that were in their possession and they have been historicalled considered an appendage to the King’s majesty. Hence, the late King H.M. Bhumibol Adulyadej owned the greatest number of white elephants. He had 21 white elephants and this can be regarded as an unprecedented achievement. Eleven of these elephants are still alive but only five of them have royal titles. Hence, how does a ‘chang phueak’ become a royal elephant? An elephant has to undergo an number of tests conducted by the Bureau of the Royal Household since it is important to ensure that the elephant is suited for the title and has not only the physical but also the behaviourial characteristics required. In the past, Thai Kings also gave white elephants as presents to friends and allies. This was a blessing or curse since an elephant considered sacred was not supposed to work and at the same time it needed care and food. Thus, a ‘chang phueak’ could easily become a huge financial burden to the owner unless the King would also provide the recipient with land for the elephant. Summing up, we may say that the white elephant has been the most sacred and auspicious animal in Thai culture since it is also considered as a royal animal related to the King. Recently I’ve had a vivid dream about a beautiful light mansion with a pool of white lotus flowers in front. I had the feeling that this place was somewhere in Thailand. I often dream of landscapes and particularly of those in Southeast Asia. I guess this is why I long to see all these amazing places in reality. Thus, I’ve wondered what the meaning of the lotus flower is and in the days following this dream, I’ve done a bit of research about lotus as symbol. First of all, I’ve learned about the spiritual and religious meaning of the lotus flower in different cultures. In ancient Egypt, for instance, the lotus was a symbol of rebirth and hence it was commonly used for wall and tomb paintings. The lotus has the power to renew itself since it loses old blooms and adds new ones in a daily cycle. The lotus is also a symbol in Hinduism and Buddhism. In Hinduism, this flower stands for eternity, purity and peace. Hence, it is also the flower of the Gods for Brahma, the ultimate creator of the world, arises from a lotus. It is very interesting to note that in Buddhism the lotus flower has even more, i.e. a variety of meanings. For example, it symbolizes self-awareness, love and compassion of all beings and things, emptiness from desire, enlightenment, victory over attachments, overcoming suffering and spiritual development. Thus, the lotus also stands for patience, purity and mysticism. You certainly know the lotus position which is a way of sitting during meditation. It is an important position in Buddhist meditation but also in yoga practices. The lotus has a deep spiritual meaning and in the lotus position the legs are crossed and tucked in a way that makes the bent knees look like the petals of a lotus. It is important that the soles of the feet are tucked away so that it is a respectful position to sit in when visiting a temple where exposing the bottom of your feet is considered rude. 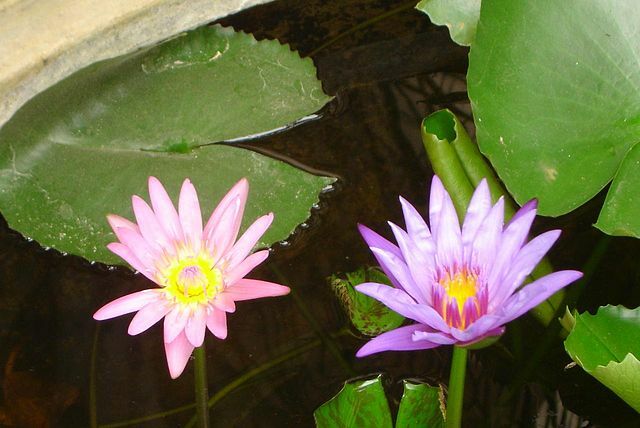 In fact, there are lotus flowers and water lilies of different colours. 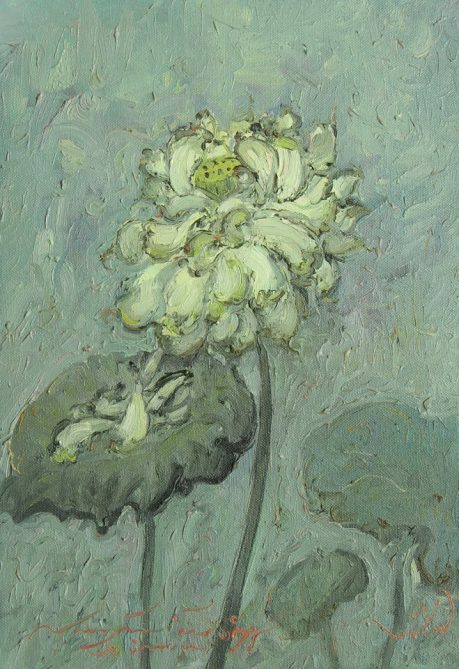 Since I saw white lotus in my dream let me focus on the meaning of this paritcular colour: The white lotus symbolizes awakening, representing spiritual perfection and purity. Hence, it also stands for peace and a peaceful mind. Well, how to interpret this dream now? Maybe I’m a person who is lucidly dreaming but the mansion and the lotus flowers surely symbolize a way to realize my longing and a path to awakening, in a worldly but also in a spiritual sense. How about you? Have you ever dreamed of water lilies or other flowers? The story of Buddhism begins with a man who became enlightened, thus gaining abiding insight into the nature of the world and its reality. Hence, the word ‘Buddha’ means the ‘Enlightened’ or ‘Awakened One’. The historical Buddha was born as a prince among the Sakyas in the year 623 B.C. 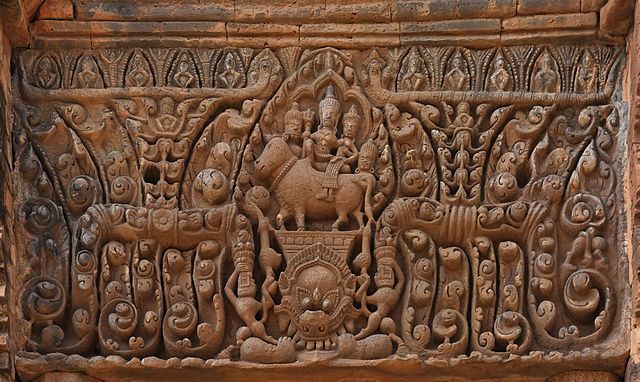 The Sakyas were a warrior caste who lived in Kapilvastu which is located in today’s Nepal. His parents were King Suddhodana and Queen Siri Maha Maya who died after he was born. The prince was named Siddhartha Gautama. There was a prediction that the prince would become either a great King or a supreme Teacher of the World if he choose to become a monk. 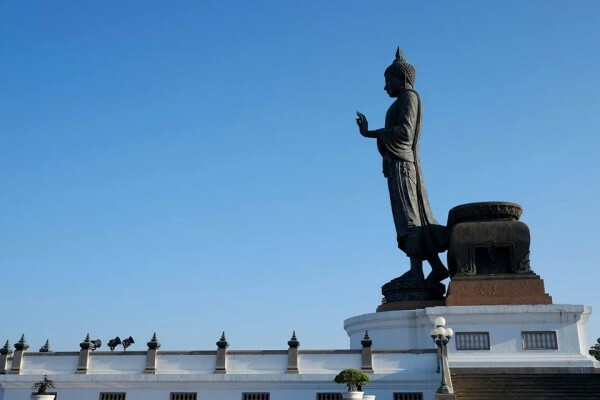 Legends tell us that Prince Siddhartha was a very remarkable personality. Even though he was surrounded by luxury and splendour, he kept a serious, meditative turn of mind. Thus, one day the prince rode through the village streets and saw an old and discrepit man, then he also encountered a man severely stricken with illness and finally a dead man. Since he had not seen such conditions before in his luxurious palace, he became preoccupied with the ultimate questions of suffering and death. Thus, at the age of 29, the prince left his palace to become a monk leaving even his beautiful wife and child behind. First, he sought instruction under several great spiritual teachers and later he undertook the disciplines of rigorous self-mortification. Finally, after six years of radical physical asceticism and abstract philosophy, he reached Enlightenment through sitting quietly in meditation beneath the Bodhi Tree. He detected the cause of suffering in craving due to ignorance, discovering a way to right view, conduct and concentration. The Buddha decided to share his insights, what he discovered through the process of Enlightenment by preaching the message of salvation (Dharma) to all people of all castes without any discrimination. Thus, he organized a community of monks, the Sangha, which included disciples from all castes. The Buddha was a wandering teacher for 45 years before he died at Kusinara at the age of 80. In fact, the Buddha was a human being and his story was a story of a rich prince who became a monk and spent many years in the jungles, villages and schools in order to achieve Enlightenment. Hence, as a man he was born, he lived and he passed away. Thus, the Buddha is neither a god nor a god’s prophet. He is not a savior who saves others by his personal salvation. He rather wants his disciples to depend on themselves for their salvation. Finally, we may also say that the Buddha does not claim the monopoly of Buddhahood. Thus, we should also point out in retelling his story that every person can achieve Enlightenment and hence Buddhahood. 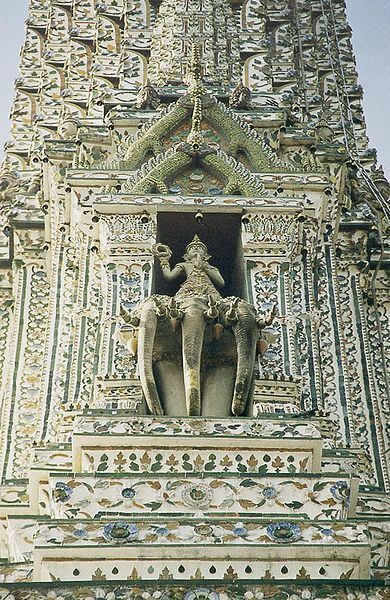 Worshipping goddesses like Mae Phosop (โพสพ), the rice goddess, has been a part of Thai culture and tradition since prehistoric times. 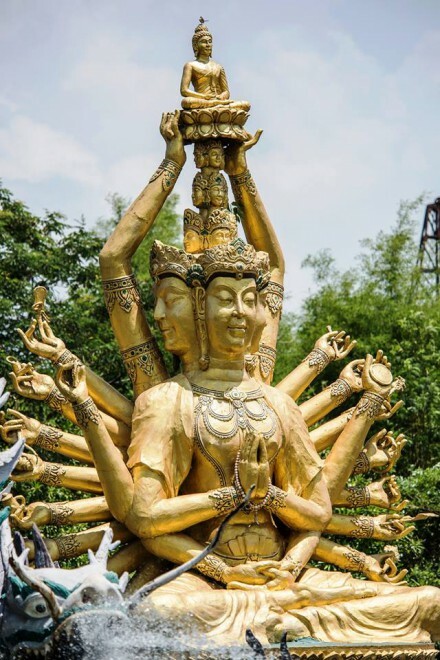 Even though the role of female deities became subservient since the introduction of male-dominated faiths such as Hinduism, Brahmanism and the official religion Buddhism, the power of the matriarchal spirit has always played an important role in Thailand. 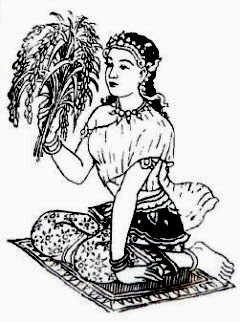 She is also known as Mae Khwan Khao (แม่ขวัญข้าว), the ‘Mother of Rice Prosperity’. Mae Phosop is considered the spirit or soul of rice, that is the main staple of the Thai diet. Thus, it is a common belief that without rice, a person cannot sustain and live long. The myth and legend of the rice goddess says that she is badly mistreated by an old widow. Hence, she flees and finds shelter with a friend. This friend is a fish that leads the goddess into the deep forest where no human being can find and reach her. As a consequence, all human beings begin to suffer from the absence of Phosop and try all that is humanly possible to find her. Finally, the fish advises the goddess to return to the humans because the next Lord Buddha will soon come to the world. 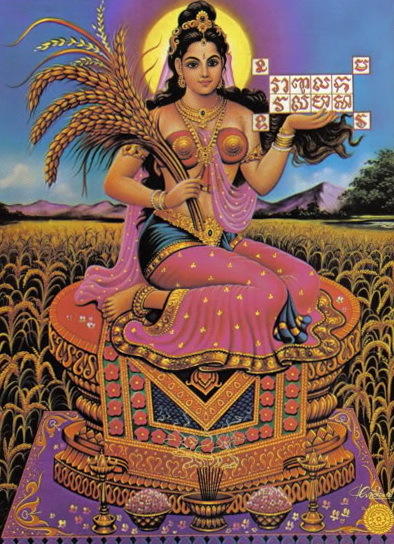 Thus, the blessing of the rice goddess is needed since the Buddha will not be able to fulfil his duty on earth without Mae Phosop. Hence, she comes back to the community of mankind to stay forever. However, before her return, the goddess asks human beings to promise her to treat her with respect forever after. In return she promises to bring abundant crops to mankind. Man keeps his word and so does Mae Phosop. 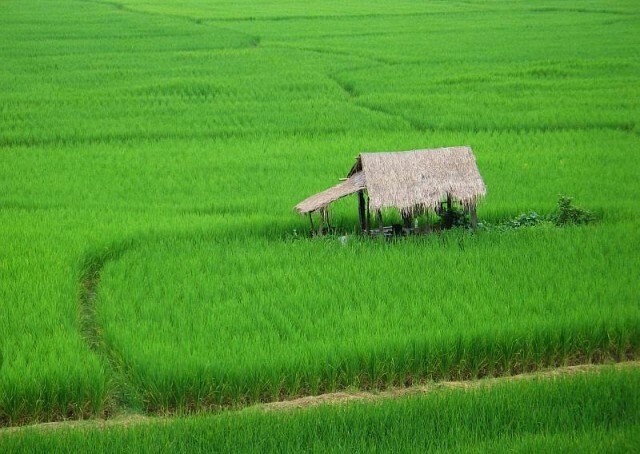 This story explains Thai fertility rites concerning the cultivation of rice. Thus, we may be justified in claiming that the relationship between humans and the ‘soul’ of rice is mutually dependent. Hence, there is also a saying that ‘The virtues of rice are 69, while the virtues of the Lord Buddha are only 59’. This proverb speaks for itself and what is more, it also seems to point out the conflict between animistic beliefs and Buddhism. In addition, it reveals an intrinsic connection and relationship between mankind and what sustains its source of life. Mae Phosop is addressed by the title of mother (mae) who provides food for her children (i.e. mankind). Thus, people are her children and they treat her with respect as they would their natural mother. Here is a clip demonstrating how the spirit in invocated. By the way, according to Thai tradition, children are also taught to Wai, i.e. put their hands in the position of obeisance and respect, after finishing their meal. 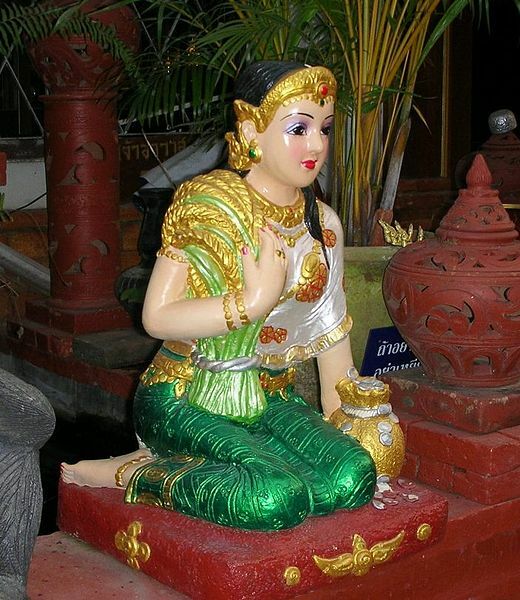 Summing up, we may say that on the one hand, the myth of the rice goddess in Thailand shows how animistic and Buddhist belief were combined in the past. On the other hand, it also reveals mankind’s dependency on a good rice harvest. Hence, people feel grateful to the rice goddess and behave respectful towards her. 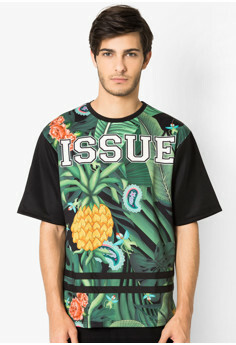 ISSUE Thailand is a designer brand founded in 1999 that wants to combine Buddhist elements with fashion. Designer pieces by ISSUE are not merely supposed to be clothing but they should reveal and bring out the wearer’s personality and charisma. Hence, this Thai desginer brand embraces the philosophical concept of ‘compassion’ and ‘never give up’ inspired by the teachings of the Dalai Lama. What is more, being a Thai fashion label, the designs are also influenced by the garments of the first Thai royals who went to Europe. 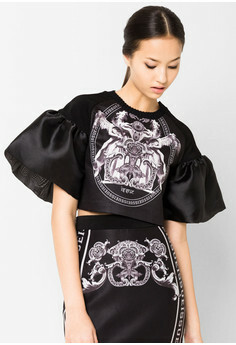 Hence, the graphic designs preferably combine traditional Thai and Baroque motifs on different kinds of clothing like tops, jackets, shorts and accessories. Thus, ISSUE is exotic and flamboyant offering women- and menswear with colourful and exotic graphic prints and motifs inspired by Buddhism. The brand’s motto is ‘Life is a journey once you stop walking you are already stepping back’. 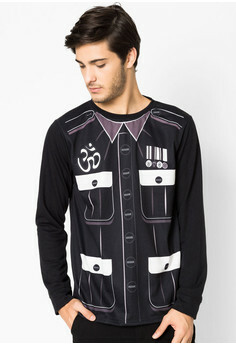 Hence, their aim is to constantly create new high quality ‘passionate wear’ for both men and women. 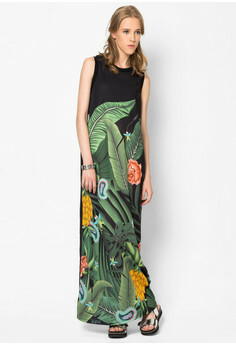 In addition, ISSUE is also concerned with the environment and thus wants to show appreciation of the fact by creating fashion that emphasizes oneness with the world and the environment. 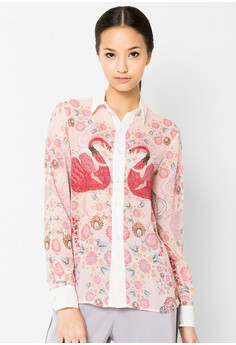 What is more, this fashion brand is also about exploring exotic cultures and absorbing their inspiring influences. We may say that ISSUE is extravagant and thus very much appeals to the trendsetter and fashionista emphasizing individualism and cultural diversity in fashion. 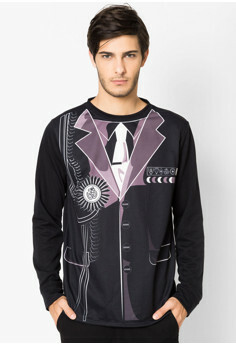 For this reason, it offers more than just fashion. Hence, ISSUE is also among my Top 5 Thai Designer Brands on Zalora 🙂 The collections are always playful and colourful, at the same time encouraging the wearers to combine their outfits in unique ways. 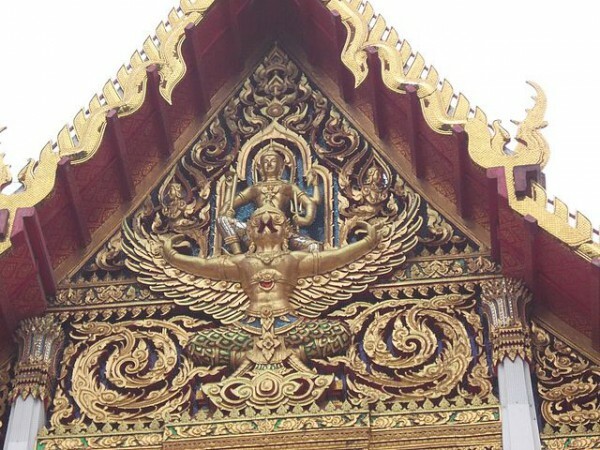 You may certainly have noticed that Hindu gods are very prominent in Thai culture. 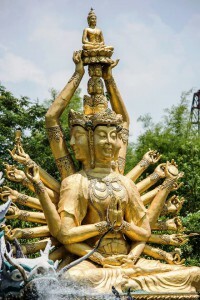 Thus, there are often images of these gods in Thai temples and shrines. In fact, Brahma, Vishnu and Shiva are the three most important Hindu gods representing the recurring and continual cycles of birth, life, death and rebirth. This trinity, along with the god Indra, Ganesha and some enlightened divinities and demons, have been converted to the Buddhist doctrine according to Buddhist belief. Hence, these gods often occur as guardians of temples and monasteries. In addition, they may also be seen attending the Buddha on important events in his life. 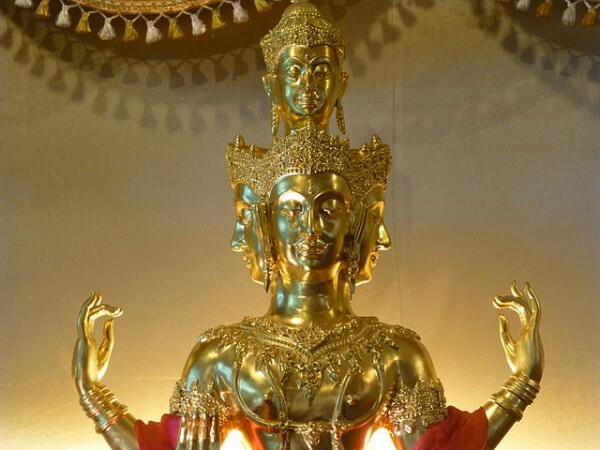 First there is Brahma (in Thai: Phra Phrom) who is the creator in the Hindu trinity. He is commonly depicted having four heads and the book of Vedas in his hand. His female aspect is the goddess of learning, Sarasvadi and his mount is the mythical celestial swan called Hong or Hamsa. Brahma is considered a guard of doors and pediments in temples. Furthermore, he is also popular as a protector of Thai hotels. Thus, in Thai culture, he is a deity of good fortune and protection. 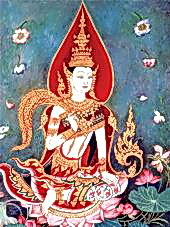 In Thai art, Brahma is depicted in attendance to Buddhism along with Indra, at the crucial events in Buddha’s life. Hence, he is also considered to be converted to Buddhism. By the way, Hindu gods might also be the subject of one or the other Thai song. For instance, Noi (Krissada Sukosol), singer of the band Pru, featured a song called ‘Brahma Brahma’. I think this song is from the horror movie ‘Pawn Shop’ (Long Jamnam, 2013). Another important god is Vishnu who is the preserver deity of the Hindu triad. In his hand, he often holds a disk and a conch shell. His mount is Garuda, the mythical bird that is half-human and half-eagle and the natural enemy of the Nagas. In other words, Garuda can be seen as the vehicle of Vishnu. What is more, Vishnu’s avatar is Rama, the hero of the Ramakien tale. In addition, this god is also associated with Thai royalty since the kings of the Chakkri dynasty have ‘Rama’ as part of their names. Similar to Brahma, Vishnu often functions as a (door) Wat guardian. Shiva is the destroyer and regenerator aspect of the Hindu trinity. He usually has a third eye that is centred vertically on his forehead. Further characteristics are a brahmanical cord across his torso and sometimes a crescent moon which is caught in his tangled hair. Parvati is his consort and his mount is the bull Nandi. 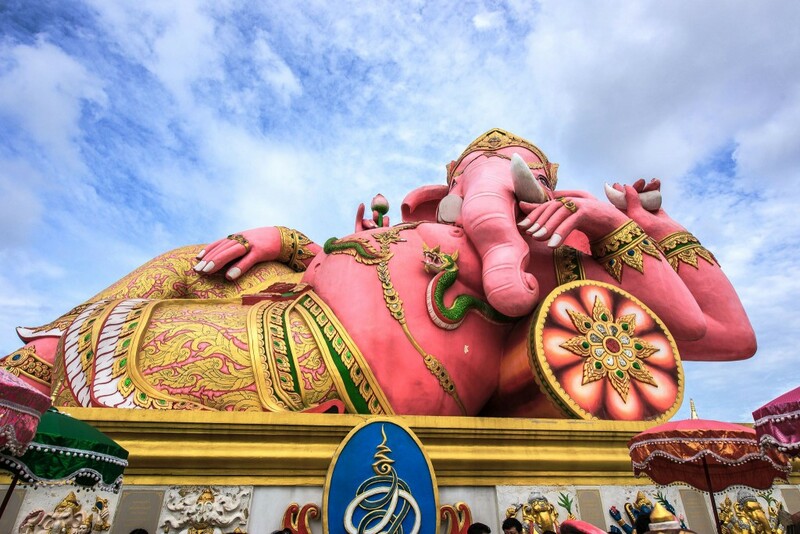 The image of Ganesha (in Thai: Phra Pikanet) is also very prominent in Thai culture. 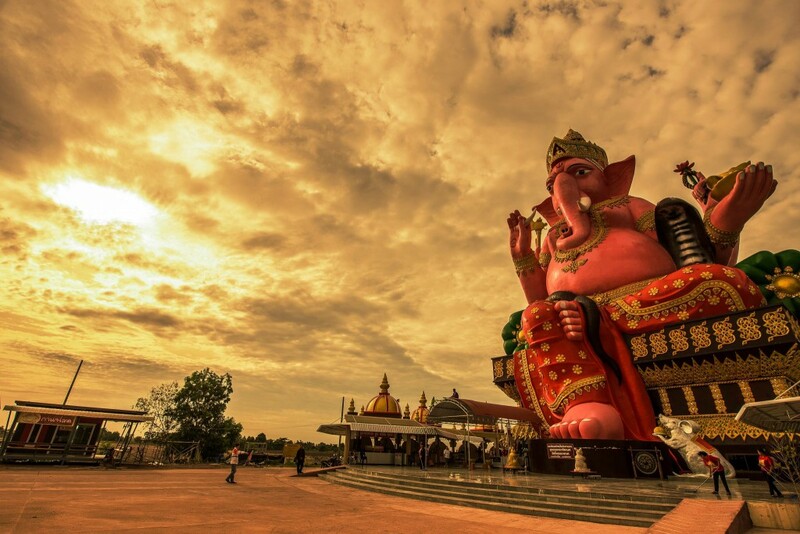 For example, there is the Ganesha park in Nakhon Nayok which is considered a tribute to this elephant-headed god who is Shiva’s son. In Thailand, he is commonly seated at temple portals. What is more, he is also the patron of the arts and a protector of business. Finally, we have the god Indra who is the god of Tavatimsa heaven. 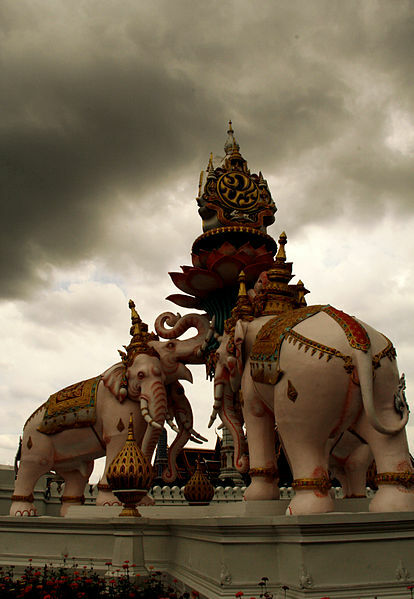 Hence, he is also the god of weather and war wielding a lightening bolt and riding Erawan, the multi-headed elephant. Indra is a temple guardian of portals and pediments. He is also prominent in the Vessantara story which is the last life of the Buddha-to-be. In addition, Indra occurs on mural paintings where he can be identified by his green colour. Along with Brahma, he is kneeling when attending Buddha during particular life events. Thus, it is indicated that the Hindu gods are subservient to Buddhism. 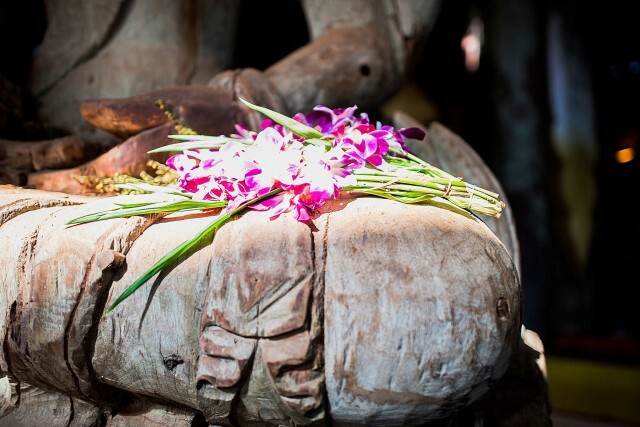 Representations of the Buddha can be found throughout Thai temple compounds. The Buddha occurs either as statue or in mural paintings. Hence, they are idealized images of the Great Buddha who lived in the sixth century BC in northeast India. He is commonly shown in either of the following four positions: seated, standing, walking, and reclining (as the following pictures illustrate). 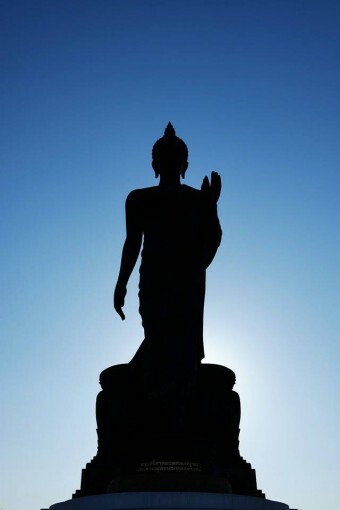 The Buddha’s hand gesture and posture refer to important events in his life. Siddhartha Gautama of the Sakya clan, who was to become the Buddha, was born in a small Hindu kingdom neighbouring to Nepal. First he became an ascetic before reaching enlightenment. Afterwards, he taught the truths he had learned and hence gained many disciples. He died around the age of 80. The Buddha put forward the Four Noble Truths concerning man’s condition and the Eightfold Path that should lead to enlightenment, perfection, absence from rebirths and finally to nirvana which is to be understood as the extinction of the ‘three poisions’, namely passion, aversion and ignorance. When these poisons or ‘fires’ are extinguished, freedom from the cycle of rebirth (samsara) is attained. In the Reclining posture, the Buddha is also referred to as being in the ‘Sleeping Lion’s’ position which is the state in that the Buddha died. Buddha lies on the right side with knees slightly bend and the left hand on the thigh. In Buddhism, the ‘Sleeping Lion Posture’ is also the traditionally recommended mode for dying. A well-known Buddha Image in this position is the Reclining Buddha at Wat Pho in Bangkok. For example, a Walking Buddha is the Buddha Monthon (Phutthamonthon) which is created in the Sukhothai style. The image performs the abhaya mudra, the gesture of Reassurance and Dispelling Fear. Characteristic of the period are the broad shoulders and pendant arm. The flat feet and projecting heels are part of the anatomy characteristic of a Great Being. 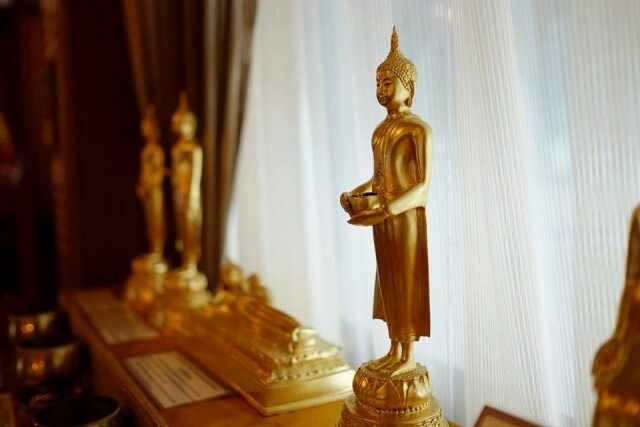 It is also important to note that there are Buddha statues for each day of the week, each in different pose. They are often lined up in a row at a temple. 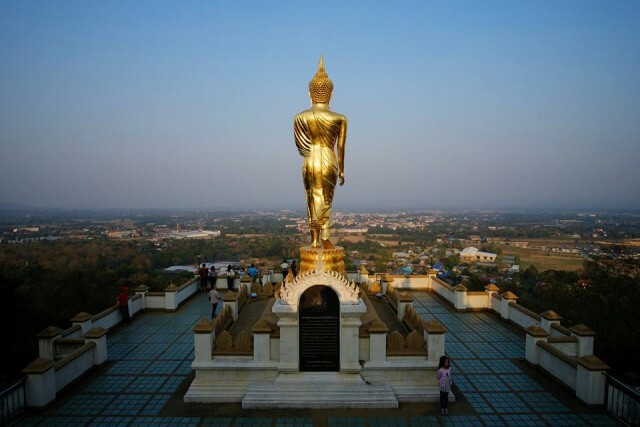 Many Thai people know the day and hour they were born thus paying respect to the Buddha image presiding over their day of birth. The Buddha of Monday is the one preventing calamities. The image for Tuesday is in the reclining posture. Wednesday, in fact, has two Buddha images, in the morning it is the Buddha holding an alms bowl and in the evening he is in the posture of retreating in the forest. The Thursday image is meditating and on Friday the Buddha is in reflection. The Saturday statue is sitting in meditation while being protected by Muchalinda’s cobra hood. Finally, the Sunday Buddha is in pensive thought. The most prevalent posture and gesture in Thailand is the Buddha in sitting position with his right hand pointing down to the earth. By doing so, he calls on the earth to be his witness that over many lives he fulfilled and accomplished himself thus being able to reach enlightenment. 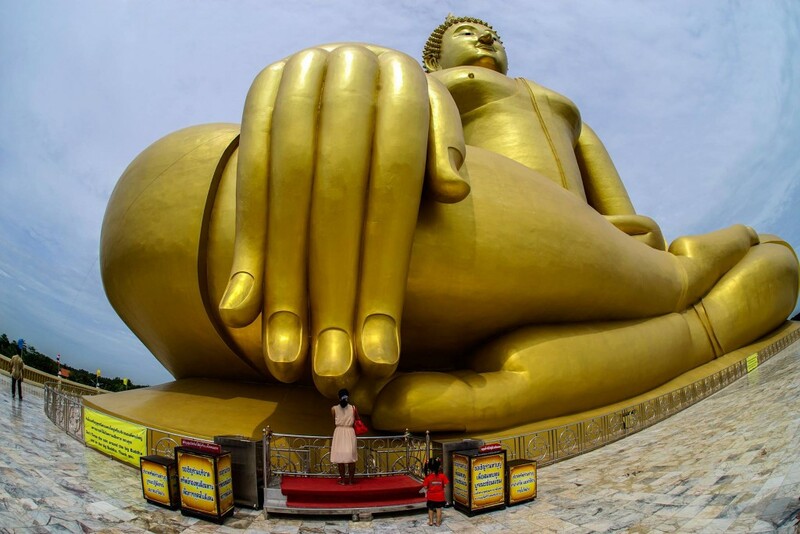 For example, the Great Buddha of Wat Muang is a seated image pointing with his right hand to Mother Earth. 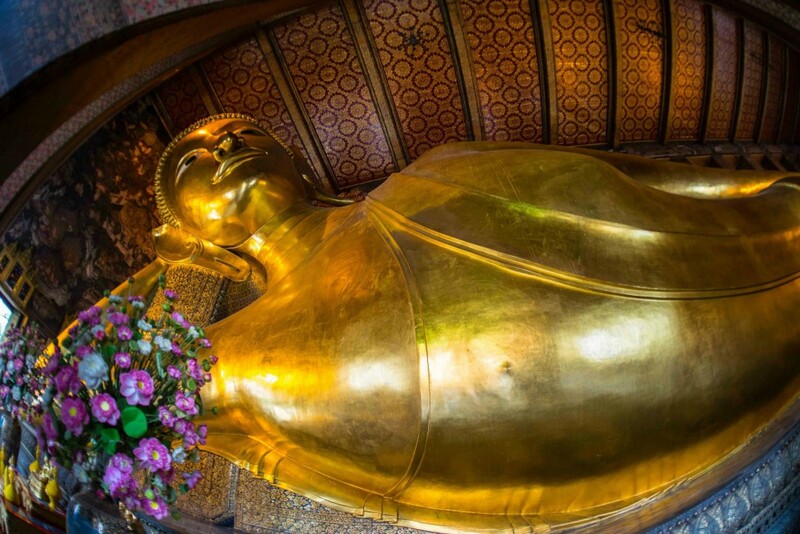 Another famous example of the seated statue is the Golden Buddha at Wat Traimit in Bangkok’s Chinatown. Today’s media review is about Thawan Duchanee: Modern Buddhist Artist by Russell Marcus (ISBN: 9786162150562). This book was published in 2013 by Silkworm Books, Chiang Mai, Thailand. The book is in English language, comprises 168 pages and is available as print version and e-formats (iBooks, Kindle, Google Books and Kobo). It costs 595 Bath; on Amazon the print version is about 18 EUR. You may take a look inside the book here. This book is a comprehensive work about Thai National Artist Thawan Duchanee. It is structured in five main sections, namely ‘Paintings’, ‘Buildings’, ‘Artistry’, ‘Philosophy’ and ‘Life’. Hence, the author focusses on different aspects of Thawan’s art reflecting Buddhist philosophy and portraying Buddhism in a subtle manner. The first section about ‘Paintings’ is subdivided into four chapters which deal with the dangers of doubt, lust, fear, and lack of concentration. What is more, Marcus points out that man’s pursuit of pleasure and escape from and avoidance of pain is primary subject of Thawan’s paintings. In addition, the work argues that virtues are exemplified in the previous lives of the Buddha. Thus, the first chapter is about the Dhammapada showing us how Buddhist teachings are reflected in the artist’s works. The next chapter, the Battle of Mara, deals with Buddha’s fight to reach enlightenment. The third part is thus concerned with the Last Ten Lives of the Buddha. These are moral tales illustrating the Buddha’s ten characteristic virtues. The fourth chapter of this section is about Seeing What Is Visible meaning to look beyond literal interpretations of Thawan’s work. The second section of the book is concerned with ‘Buildings’ created by the artist. This is mainly about Thawan’s outstanding architectural and decorative achievements in Chiang Rai and Germany. Hence, the fifth chapter of this work deals with the Buddhist Meditation Room and the artist’s paintings from the Buddhist meditation centre of a German castle. Finally, the following chapter is about Thawan’s greatest achievement, namely the Black House Museum village in Chiang Rai (The Biggest Work of the Painter Is Not a Painting). The next section ‘Artistry’ is about Thawan’s mastery of a wide range of styles, techniques and media. Thus, the fourth section ‘Philosophy’ lists what the artist said about his own work, including his concerns and passions regarding art, artworks and his own unique way and style. The final section ‘Life’ is Thawan’s biography. In my view, this book is a very comprehensive and detailed work about Thawan’s different art forms. In particular, I welcome that there are more than 100 colour and black-and-white images that serve to illustrate the diversity and versatility of the artist’s work. In addition, I very much appreciate that the book offers deep insights into Thawan’s creative genius and also explores his philosophical backdrop. Finally, I can highly recommend Thawan Duchanee, Modern Buddhist Artist. Particularly to everyone who is interested in the versatility of Thai and Buddhist art. Maybe you remember my article about Thawan Duchanee’s Black House Museum that is called ‘Baan Dam’ in Thai. 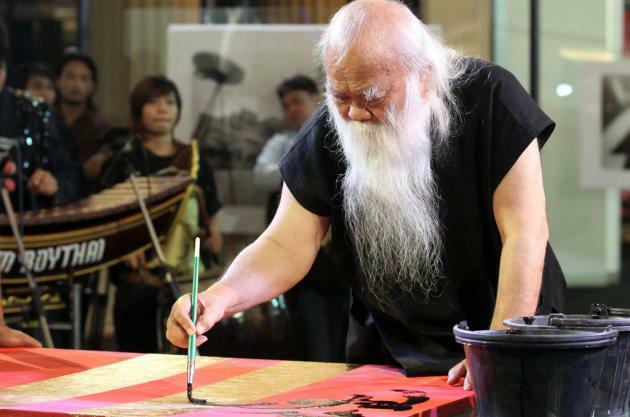 Apart from creating the Black Houses in Chiang Rai, Thawan (1939-2014) was also a great Thai and Buddhist artist who from a very young age had the inspiration and intuition to paint. 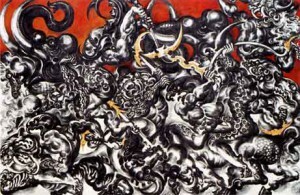 In fact, the artist was called “as pure Thai as glutinous rice and mangos” by the former Thai prime minister M.R. Kukrit Pramoj. Even though Thawan lived a secular life, he was very much in harmony with his Buddhist matters. In addition, he looked like a sage and wise man with his long white beard. Thawan saw his art works as an intense interpretation of the Buddhist dharma. Hence, he was primarily concerned with human beings. However, he used animals as medium, vehicles and symbols to voice his concern. Thus, on the one side he presented predatory animals like tigers to stand for lust or the desire for pleasure. On the other side, he portrayed victimzed or attacked animals that represent fear or the desire for escape. 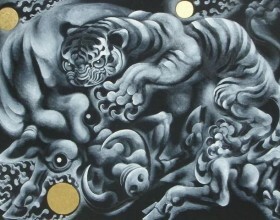 In a metaphorical sense, Thawan Duchanee used animals to symbolize the lower traits or animal natures inherent in human beings. These lower traits are for instance, fear, greed, lust and the ego. These animal instincts interfere with human spiritual growth. The aim is simply to conquer undesirable personality traits. 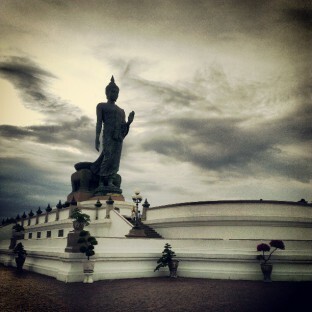 Similar to Buddha’s victory over Mara symbolizing ‘Samsara’, the circle of life and death. However, the artist also pointed out that humans are different from animals because they have the power of thinking and creating. In this sense, human beings are able to create civilization, culture and art. This is exactly what the artist did. In the following video, Thawan talks about the different phases of his art works and his general intentions. Thawan’s artistic works are indeed complex and versatile. We may say that he created a unique Asian artistic expression by combining Thai, Chinese and other Asian traditions like Japanese calligraphy. 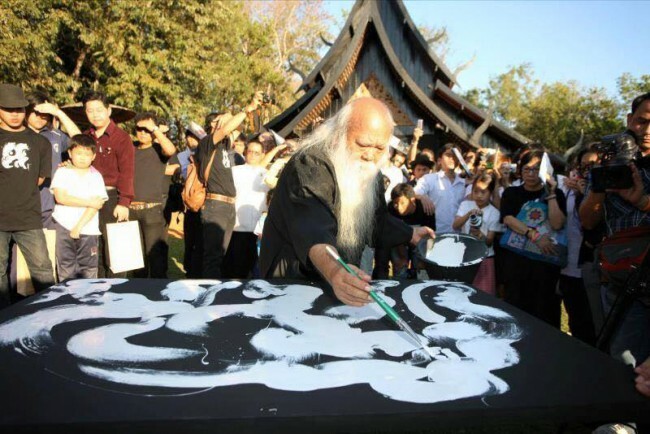 Hence, the artist also did Sumi-e painting which is a kind of Zen ink-brush painting. The special feature of such Zen brush painting is that the artist needs momentary concentration and speed to create the work with no intention or doctrine of mind. 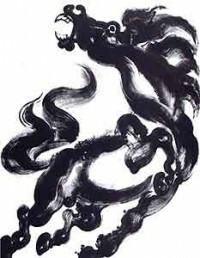 Thawan described this technique as “a wild boar running forward to attack, my brushstrokes show the same speed and strength as the running boar” (T. Duchanee, Modern Buddhist Artist, p. 111). What do you think about Thawan Duchanee’s art? Do you find it representative of Thai and Buddhist art generally? Buddhism is a prominent subject in Thai movies and hence such films are also referred to as belonging to the ‘monk genre’. In such movies, Buddhist monks are the protagonists and it is important to note that they also frequently occur in the genre of Thai horror movies. Monks as main characters provide guidance to people seeking their advice. In addition, they also fight and beat evil spirits. However, the Thai Censorship Board claims that Thai movies must generally depict Buddhism with respect and reverence. Otherwise a film might get censored. Thus, I would like to focus on the comedy trilogy of The Holy Man. The first movie of this trilogy is called Luang Phii Teng (หลวงพี่เท่ง) and was released in 2005. It deals with a former bad boy and troublemaker who has become a monk. He comes to a small town and resides in the Buddhist temple of this city. There he is facing opposition from a local mafia boss who presents his daughter as a fake spirit medium. It is a simple but nonetheless entertaining comedy that was the second highest-grossing movie of the year 2005, starring the popular Thai TV comedian Pongsak Pongsuwan. The trailer is only available in Thai, nevertheless, even if you don’t understand, you will get the comic elements 😉 You can also watch the full version of this movie (in Thai) here. The Holy Man 2 draws on the great success of the previous movie. However, in the second part King of Thai Rapper Joey Boy has the leading role as the young monk Luang Phi Tet who comes to the small village. He thus replaces his predecessor Luang Phi Teng who has gone to Tibet. He wants to become a forest monk but faces many obstacles. Nevertheless, Luang Phi Tet comes to a temple close to a quarry. Every time there are explosions in the mountain, the temple is damaged with debris and monks have to wear helmets to protect their heads. The situation is dangerous and the monk wants to help. In fact, Luang Phi Tet is innovative and even renews the way to say sermon. While the abbot sings “Luuk Thung” (ลูกทุ่ง), Luang Phi Tet creates his own Thai hip hop version. Hence, the result is a fun song with Joey Boy, Buddha Bless and the Gancore Club 😉 The full version of the film is available here but it is only in Thai. In 2010, the third episode of The Holy Man 3 (Luang Phi Teng III) was launched. In my opinion this film is the funniest of the trilogy 😉 The movie is about two new monks. One of them is Noi Wongpru (played by Thai-American singer and actor Krissada Sukosol), a former rock star who decides to enter monkhood because he is needs calm and is bored with materialism. He is looking to find peace and tranquillity for he is a stressed and burned out man. The other young monk, Phra Prasert is played by Buddha Bless singer Gui Oui (Natee Ekwijit). The abbot reminds Noi of the analogy between a hose splashing randomly due to water pressure and the restless spirit always wandering. There are numerous funny gags and comic moments when the monks are going out to collects alms. Hence, they also encounter the short chubby boy and very funny comic actor Koeti Aramboy who tries to offer food to the giant monk who has the telling name Phra Yoakyake (Yoakyake Chernyim). In fact, I find the character of Phra Yoakyake truly hilarious 🙂 and the name indeed suits him well, since ‘Yaokyake’ means ‘giant temple guard’. The monks face a lot of adventures. Hence, robbers steal the temple bell and then they also try to behead the Buddha statue and steal the head. The leader of the gang is a Chinese vendor. As a consequence, the monks are really distressed. 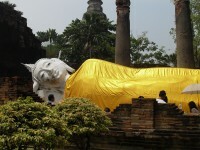 However, they are also lucky since the main Buddha statue remains intact and is not stolen because it is is too heavy. Akom Preedakul acts as a funny Thai boxing trainer who brings coyote dancers to the temple 🙂 There is also a sequence about villagers who flee ghosts thus referring to 1980s and 90s Thai comedy ghost movies. 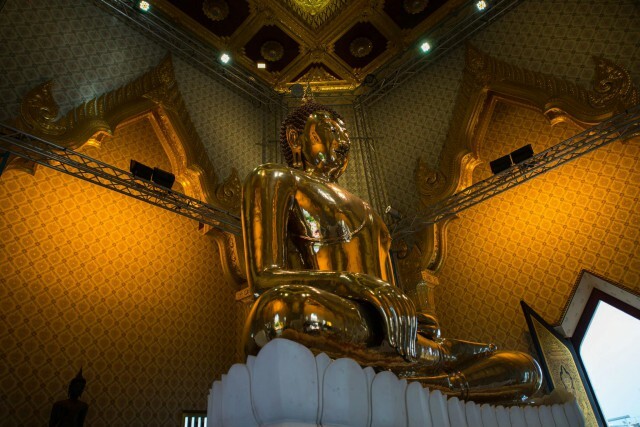 Since the head of the Buddha image is stolen, the giant monk Phra Yoakyake disguises himself as Buddha statue in order to trick the robbers and to find out where they hide the bell and the Buddha head. Finally Noi asks his former bikers friends for help. They are led by Ed Carabao who is the real leader of the famous Thai band Carabao. There is a happy ending because the robbers are captured and the Buddha head recovered. A full version of the movie is available here. I think the Holy Man trilogy deals with Buddhist topics in a fun and effortless way without being disrespectful, although some scenes might appear a bit silly 🙂 Do you know this trilogy?